Last month I updated my general 2016 goals to SMART goals. That is, goals that are: Specific, Measurable, Achievable, Realistic and Time-Bound. I set out some specific goals for July and for the rest of the 2016 year and each month I am going to review my progress towards those goals. The goals I set in January are below. SMART Goal – change permalink structure, write sponsored content, explore other revenue options, edit and publish pdf e-book in a format available for sale. SMART Goal: I am going to lose 10 lbs. by the end of 2016. I will do this by tracking my food intake, reducing my snacking and eating more appropriate portions of food. I will continue going to Aikido and biking to work as often as possible. I wish I could say I did all of those things in July. I did start tracking my food intake again… and then I stopped. Even though it is in my calendar to record each meal, I generally delete the reminders without taking any action. My daughter and I also stopped going to Aikido – for the summer at least. It didn’t make sense to be paying to go when she was going to be away so much in July and well, it turns out I am lazy. It has been really hot here most of July and the dojo is not air conditioned so when I think about going to Aikido and it is hot I just think about how sweaty I am going to be. I haven’t ridden my bike to work once in the past month. My excuse is that I have been working from home every other day and it is a pain to pack up my computer and work stuff in addition to work clothes every time I bike into work. That is just an excuse too. It comes back to the whole being lazy thing. I am pretty sure I have put on weight this month. I think I am trying to do too many things at once and since I am not having success in any of them I stopped doing them all. So for August I am only going to track my food intake. That is achievable and once I am back in the habit of doing that I will add another piece in to the mix. I am going to rebuild ThomasWoodcrafts.com to make it easier to use from the back end and more attractive and useful for shoppers. I will complete the rebuild of this site by the end of July. I am going to write one promotional blog post and send out one newsletter to my mailing list every month. I will sell my products at three – four craft shows in the fall. I will identify two more shows to apply for and submit applications by the end of the summer or as soon as the applications open. I will develop an online marketing strategy by the end of July and implement that strategy starting in August. I will sell at least $500 worth of product per month by October. I had planned to do the site rebuild in July. Instead I got caught up watching the US political conventions every night for two weeks and that threw me off my schedule. I love a good political speech and the American rhetorical tradition is full of them. I am now back on track and figuring out the best theme and layout for my site. I will get it done over the next few weeks. I launched a partnership with a friend who is a fantastic artist. 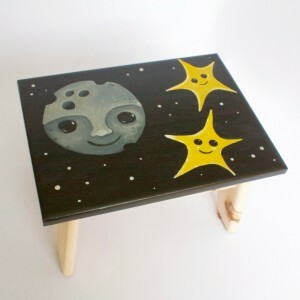 She has started painting designs on my stools and we now have two of them for sale. I also started making more boards and products in advance of the fall craft show season. In August I will compete the website rebuild and continue building up my inventory for the fall show season. I will also complete my marketing plan and begin to implement it. I will clean up two-three archive posts a week to include images until they are done. I am not sure how many I have that need this kind of updating. I will develop a list of other sites where I would like to submit guest content by the end of July and I will submit two pieces of guest content to other sites every month with a goal of having one published very couple of months by the end of the year. I will continue the work I have been doing to promote the blog and increase my readership. I will increase my readership from my current level of 6000/month to 10000/month by the end of 2016. I will continue to seek sponsorship opportunities and will publish one to two pieces of sponsored content per month. I will continue to review and add advertising and affiliate links to generate revenue without significantly impacting the readability of the site and content. In July I changed the permalink structure and redirected all of the old links to the new ones. I also identified and repaired more than 100 broken links throughout the blog. It seems a number of them had broken when I migrated the site to a new host last year. Others to external sites had broken when those sites made changes of their own. I still have more to resolve, but they are mostly inconsequential issues and I will sort those out over time. I updated four or five older posts, but as mentioned above, I got distracted by the political conventions so wasn’t as productive as I could have been. The same is true for my e-book. I am going to complete the editing over the next couple of weeks while I am on vacation. I have started a list of sites where I would like to submit guest posts and will finish up that list over the next week or so. I have two posts in the works that I will submit by Mid- August for publication. I published four sponsored posts in July. I have a couple more in the works for August and need to seek out new opportunities for the fall. I set up Google ads on my site in July. I wasn’t particularly happy with the banner ad space and so I have removed it for now and will rework it. I’m not sure if I will continue running them. I think I would rather work with local or affiliate partners instead of Google ads. I have to think about that a little more and do some work and testing on that front. I have included more affiliate links in posts where relevant, mostly for books. I haven’t seen any sales yet, but I am still figuring out how it all works. In August I am going to write a number of additional posts to have in reserve that I can draw upon during the busy fall months and to free up some time to write and submit guest posts to other sites. I will also continue the work of updating older posts on my site. I am also going to set up a regular newsletter schedule. I have sent out a few newsletters on an irregular basis and now I am going to set up a schedule for myself. Sit down with my partner and then with all of us as a family and talk about what everyone wants and set priorities as a family. By the end of July we will have a plan for how to spend more time or at least more quality time together for the rest of 2016. We haven’t done this. I have no excuse. I didn’t review my goals earlier in the month and forgot about this plan. It will happen this month. SMART Goal: I have no idea if this will work or if it is realistic. I am going to set a reminder in my phone to remind me to smile at five specific times of day. I will re-evaluate this approach by the end of July to see if I think it is working and helping me smile more generally. I also forgot to do this. I am smiling more though because the other thing I accomplished this month was to get a new job after a couple of years of seeking a new opportunity. In addition to a new challenge, I will be earning more money which is going to make a big difference in our general underlying stress levels since we will theoretically no longer be living paycheque-to-paycheque and will be able to start paying down debt and building up savings. In August I will start my new job and its associated paycheque which will bring more smiles. I have also set up my calendar reminders to see if those reminders make a difference. Time to get to work. I have set out several specific goals to accomplish in the next month and I will get those done, write a follow up at the end of the month and add in specific goals to complete for the end of September. If you’d like to get in on the newsletter action and receive exclusive Dad Guide content and e-books you can sign up here! You will receive a free copy of the Dad Guide: Your Daughter and Her Period when you subscribe.